This weapon is a double rifle of small hunting. The steel barrels smooth in gauge 16 are juxtaposed. The lock is of hammerless type with key “top lever”. He carries English engravings to “rosettes”. Mounting probably in drowning is of pistol type. - ELG* in a crowned oval: acceptance post 1893. - Coupled AC *: countermark of the controller post 1877. - OPV surmounted of a stylized lion: test with the powder without smoke post 1898. - 16-65 in an omega lying: gauge nominal and length of casing post 1924. - Letter i tiny: letter annal 1930, year of manufacture of the weapon. 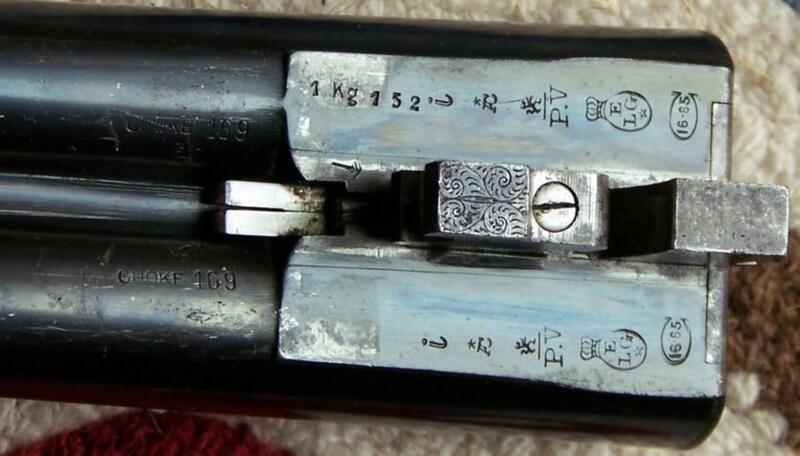 - 1 kg 152: weight of the barrel which can draw from the powders without smoke (weapons smooth) except for the gram. In use of 1924 to our days. I did not find of BOUDIN J.M. 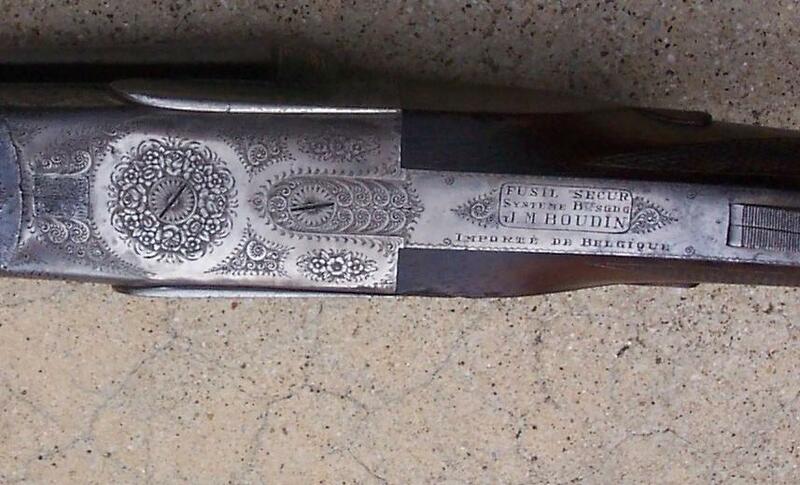 among the arms manufacturers of Liège of the time (1930) and the mention engraved on the weapon “Fusil sécurisé. (Rifle protected) Système Breveté Sans Garantie du Gouvernement –Importé de Belgique. (System Patented Without Guarantee of the Government - Imported of Belgium” left me perplexed! Indeed is mentioning S.G.D.G is only a French practice (legal?? ), ever used in Belgium. In the same way, the mention “imported of Belgium” implies that it is a French arms manufacturer who imported the weapon into France. Mr BOUDIN probably made manufacture this weapon in Liege where the labour was skilful, many and cheap. BOUDIN, arms manufacturer with Vendrôme (Loir et Cher) in 1900. BOUDIN, arms manufacturer with Robion (Vaucluse) about 1931. BOUDIN & GAUTHEY (Ganthey?) Manufacturers of weapons of hunting with Saint Etienne (Loire) in 1926/1931.